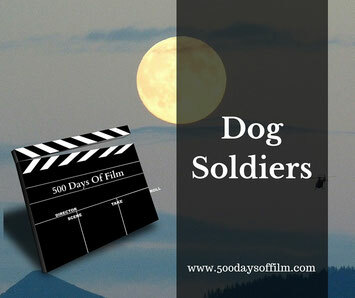 500 Days Of Film Reviews Dog Soldiers And Has A Blast With This Horror Comedy With Added Bite! Six soldiers are dropped into the Scottish wilderness. They are part of a routine military training exercise. However, when they discover that a special ops camp has been savaged by a terrifying beast they realise that all is not what it seems. After watching and loving The Descent, several people suggested that I watch Neil Marshall’s earlier film, Dog Soldiers. Well, I didn’t need much persuading! I did worry, however, that (post The Descent) my expectations might be too high. Was I anticipating too much from Dog Soldiers? Well, I am pleased to report that I had a total blast watching this film. It made me laugh, it made me jump and it certainly made my pulse race! Dog Soldiers works so well as a horror comedy because of its casting. Marshall chose a group of really interesting actors - deciding to cast many in roles that would surprise (and delight) the audience. Marshall adds that McKidd’s agent advised him against choosing “anything daft like a werewolf movie” but that the actor remained keen - “he thought it would be fun, so his attitude was just perfect from the start”. Each individual performances in Dog Soldiers shows the total commitment that Marshall got from his cast. This is key to how the film achieved its perfect balance of horror and comedy. Neil Marshall had holidayed in Scotland for many years and had always been fascinated by the idea of something fantastical living in the forest. This made the choice of location for Dog Soldiers easy. However, I was surprised to find out that most of the film (apart from the helicopter landscape scenes) was actually shot in Luxembourg. Regardless, the film works because of the locations that were selected. The forest is remote with the potential of something ‘other’ lurking around every corner and the house is as creepy as any cabin in the woods. Yes Dog Soldiers is meant to be funny but the film’s werewolves are nothing to laugh at - when you finally see them they are both stunning and scary. I would often rather not see the monster in a horror film because I find what you can’t see far scarier. However, the werewolves in Dog Soldiers are really effective. Marshall cast dancers as the wolves instead of stunt actors so that they would move in a fluid, graceful and, yet, really unsettling way. He then designed the monsters to be extremely tall with an enormous reach. Meanwhile, sets were built shorter than normal to make the creatures have to bend to enter. The werewolf design in Dog Soldiers is just perfect - you can understand why they are often cited as the best of their genre. One of the things that I love about The Descent (and something that was pointed out to me following my post on the film) is the pacing. It may be a cliche but you really are on a roller coaster ride - once you get on, there is no let up until you are left breathless at the end. The pace in Dog Soldiers is also superb. The story starts and, before you know it, you are in the midst of a nightmare that won’t end until dawn. I have watched a number of horror comedies and few have managed the balance that Dog Soldiers achieves. I loved the humour in this film - it was particularly welcome during some of the more icky moments! For these five reasons (and probably many more that I will think of later) I think that Dog Soldiers is a perfect example of an effective horror comedy. Some of the soldiers in the film are fed up because they are missing a crucial England versus Germany football match. The film was shot before the actual match took place and yet managed to predict the score - spooky! Simon Pegg was offered the role of Spoon but passed to film Shaun Of The Dead. Have you watched Dog Soldiers? What did you think of this movie? Do you agree with me that it is a perfect example of a horror comedy?